Fishbone has been trailblazing its way through ska, funk, punk, and rock fusion for 25 groundbreaking, horn-laden years. The band sprouted in Los Angeles’ burgeoning, alt-rock scene in the mid-‘80s, their sound often imitated, but never duplicated. Angelo Moore’s ability to combine thought-provoking, humorous social commentary with Fishbone’s frenzied, up-tempo music and frantic, euphorically entertaining stage show has cultivated their undisputed reputation as one of the best live acts in music history. Flea (Red Hot Chili Peppers) calls the band “an important musical institution.” Gwen Stefani of No Doubt fame says, “the band gave us the inspiration to be a band.” Praise and admiration for Fishbone flows from Perry Farrell (Jane’s Addiction), Jerry Cantrell (Alice In Chains) Rob Trujillo (Metallica), Questlove (The Roots), Chuck D (Public Enemy) and the likes, many of whom have toured with the band. The band has performed on Jimmy Kimmel Live! and Angelo Moore sat in with The Roots, another band that counts Fishbone as a major influence, on Late Night with Jimmy Fallon. The critically acclaimed documentary, Everyday Sunshine: The Story of Fishbone, is narrated by Laurence Fishburne and won the LA Weekly’s Critic’s Choice Award at the Los Angeles Film Fest in 2010. A documentary about the American spirit through one of its most creative forces, it highlights the band’s substantial legacy in contemporary music, but also the struggles, adversity, and inner turmoil that has surrounded its career. Everyday Sunshine aired on Public Television’s AfroPop series as well as Encore in 2012. 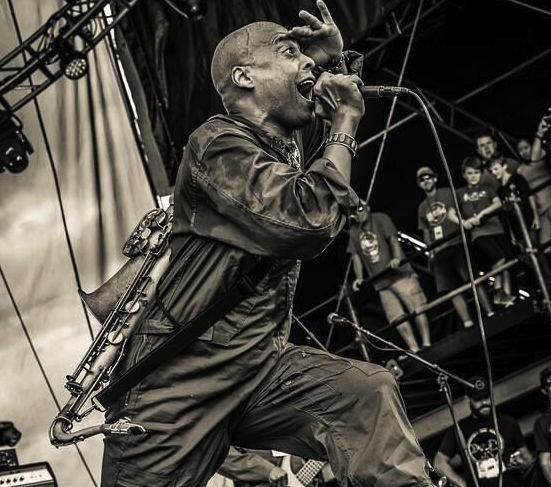 Fishbone continues to tour the world, playing the best festivals (Gathering of the Vibes, Outside Lands, Montreal Jazz, Bumbershoot, Voodoo Fest, Wakarusa, the list goes on) and tours with artists as diverse as Slightly Stoopid, Wu-Tang Clan, and Trombone Shorty. The current member lineup includes original members Angelo Moore, aka Dr. Madd Vibe (vocals/sax/theramin), Norwood Fisher (bass/vocals), and Dirty Walt (trumpet, vocals), as well as Rocky George (guitar), Paul Hampton (keyboards/vocals), John Steward (drums), and Jay Armant (trombone, vocals). In addition to their MainStage set, the band will participate in a late-night, post-fest jam at Fassler Hall with other festival artists. The free event is from 10:00-midnight and 21+.